There are so many ways to support the Museum and ensure its continued mission to preserve, restore and operate historic examples of railroad history. Being a member is one of the easiest ways to show your support, and membership comes with many benefits, too! Membership is valid for one year from the date you join. Do you buy from Amazon.com or Endless.com? Just click through those links when you start shopping and the Museum will receive 4% to 8.5% of your purchase. It's that easy! With no outside source of funds, ticket revenue, membership dues and financial donations make up the entire revenue base for the Museum. You can donate cash or stock to any one of several funds, or direct the Museum to apply your donation to a specific project. No amount is too small. In addition to financial donations, the Museum is also glad to accept donations of labor and materials. It takes a lot of parts, materials and machinery to maintain, restore and build new exhibits at the Museum. Without our fantastic volunteers, all the ticket revenue, membership dues and donations would mean nothing. 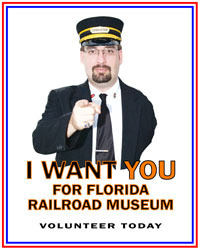 The volunteers bring the Museum to life and we'd love to have you join us. © 2017 Florida Railroad Museum, Inc.